The Samsung Galaxy S10, S10+, and S10 Lite are three of the most anticipated smartphones of 2019. Leaks and rumors are pointing towards everything from display holes and triple cameras to in-display fingerprint scanners and no bezels. 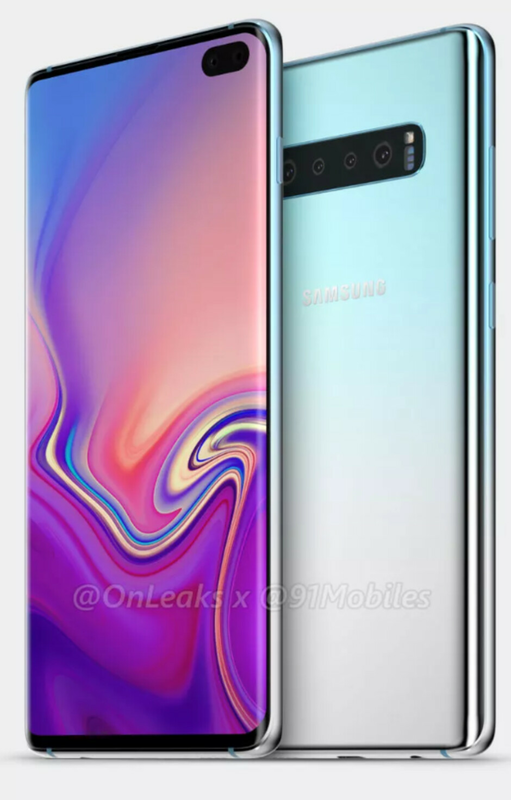 But today, in a very unexpected leak, the first renders of the upcoming Galaxy S10+ courtesy of 91Mobiles and @OnLeaks have been published online revealing everything about it. Kicking things off with the front panel design, the Galaxy S10+ once again retains Samsung’s signature curved edge display. Unlike previous-generation devices, though, a pill-shaped display hole in the corner of the panel has been included and is home to two selfie cameras. Elsewhere, the side bezels appear almost invisible, while the top and bottom bezels have decreased significantly, creating a much more uniform look. Moving over to the rear, a Galaxy Note 9-like horizontal camera setup is included. This time around, though, the layout gains a third 16-megapixel camera complete with a wide-angle lens and an unspecified fourth sensor. These accompany a new16-megapixel main sensor and a 13-megapixel telephoto camera. Another change comes in the form of the rear-facing fingerprint scanner which is now no more – the smartphone adopts a more modern in-display solution. On a final design note, an aluminum frame is sandwiched between the glass panels. Towards the bottom, Samsung has included a USB Type-C port alongside a speaker and the 3.5mm headphone jack. This is paired with a microphone on top and the SIM card tray. Also, as with recent Galaxy flagships, this particular model includes a volume rocker, a power key, and a dedicated Bixby button. Although the Galaxy S10+ isn’t expected to make its debut until late February 2019 at MWC in Barcelona, most of the smartphone’s specs have already leaked. Depending on the region, the device will be powered by the Exynos 9820 or the Snapdragon 8150. This should then be paired with a respectable 6GB of RAM and at least 128GB of internal storage. The display sits at 6.4-inches in size and, according to 91Mobiles, is backed up by a 3,700mAh battery rather than the rumored 4,000mAh cell. As this smartphone is still three months away, it’s worth taking this leak with a pinch of salt. However, the fact that this particular render was created by Steve Hemmerstoffer does indicate that the showcased design is pretty close to the final product. This looks just simply awful with that awkward cutout. I cannot understand how people like this assymetric look on the screen. This is one of the most asymmetrical phones lol, I'd rather have a centered notch lmao. What's tf is this Sammy? This is like a miniature note 8 tbh. So much for the anniversary models looool. You do realize this is a render that has nothing to do with Samsung? Its Bankz He doesn't understand anything. I will say, i hope this isn't what its going to be. They’re too stupid, blind, and too busy trolling to realize that SMDH. These iFools actually think that’s it, and Samsung is actually showing the phone. I hope it is not the real deal. If it turned out to be true that would be ironic. It looks aweful.. A notch looks better than this.. I wouldn't mind a small cutout though. Since I've never had an iPhone that's funny. Look up the definition of assymetry and then tell me about it. My response was to bankz. Blame PAs poor commentary section. Yeah I don't understand either. And they had the nerve to make fun of apple. I hate this notch/cutout trend. It is impossible that these renders show the true design. No even decent designer would create a hole in a display like shown in the renders. The screen area above and on the right side of the cutout would be left useless because the area is too small to display any kind of content. I cannot imagine that Samsung would make such a mistake. Very true but from a quality design standpoint a wide notch makes that same experience even worse. It's a transitional approach and it's unfortunate Samsung went this route. How to understand your comment? For example the iPhone notch allows to show content to the left and right of it. Sure, the content is limited because the space to left and right of the notch is limited but there is utility. I don’t see any utility in the screen area above and to the right of the cutout. The iPhone doesn't show content to the left and right of the cutout, it cuts out part of the display. Both approaches are needless compromises, either cutout or notch. Bad design either way. Ew, no thanks, I still prefer a notch instead of a hole that big. Maybe a perfect circular looks better like A8s. I don't dislike it ? The front of this phone looks like the back of the 8 plus....lol! I’m sure they can fit those front cameras in that big bezels. No notch. No hole. Just a thin bezel top and bottom, like we have now. Either design (notch or hole) is an unnecessary compromise with no payoff. If this is real, then it is freaking ugly! and extremely annoying as it is too big and on side instead center. Notch is far better than this stupid side big hole! Of course it's looks fake, because any unofficial render is 100% fake.